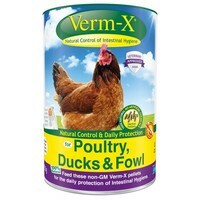 Verm-X Pellets for Poultry, Ducks and Fowl have been developed to be used as a convenient and completely natural method of intestinal hygiene control. Designed to provide year-round support that is both gentle and supportive of your bird’s digestive system, Verm-X Pellets, as with all natural supplements, may take a little while to get into their system. However, once established it can provide lasting and effective active control of your bird’s gut and promote overall health and wellbeing. As it can be difficult to monitor drinking water, Verm-X Pellets are perfect for free range birds as they can be added as a top dressing and mixed in with their regular food ration. Furthermore, as the ingredients are completely natural you can still continue to eat your hen’s eggs whilst using the product. Add pellets as a top dressing to your birds regular feed. Add 2.25g per bird per day as a top dressing to their regular feed ration. Repeat for three consecutive days each and every month. Feed half the amount to chicks between 2-4 months of age. The full adult amount can be fed from 4 months of age.